Inspired by a residency in New York, Merryn J Trevethan’s Thanks for the downgrade... (you should all be fired!) is a painted portrait of a bustling metropolis full of contradictions – what Trevethan describes as a “seemingly infinite cycle of madness on endless repeat”. 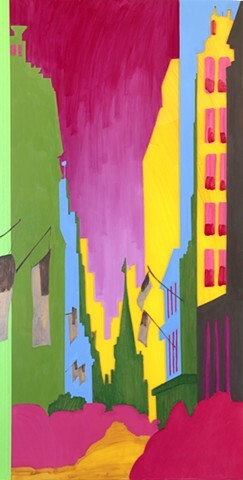 In the gallery, the works bleed, stretching beyond the frame and onto the wall and beyond, engulfing the viewer in an ambiguity that parallels the cultural, economic and environmental instability of our great cities.